Unit hydrograph information could be supplied to InfoSewerH20Map Sewer Pro using the icon located at the operation data tab of the control center. Using this icon, the user may create a new unit hydrograph from scratch or by cloning an existing one, and may edit or delete an already developed unit hydrograph. The procedure for creating a new unit hydrograph is described below. Right click on the unit hydrograph icon ( ). Select new, provide unit hydrograph ID and description on the initiated dialog box, and then click Ok. At this stage, a Unit Hydrograph dialog box shown below would appear. Depending on the type of unit hydrograph (i.e., natural or synthetic) to be created, one needs to provide all the necessary information. Each of these data is described below. Drainage Area: This refers to total area of the subwatersheds draining up to the location where the unit hydrograph is being derived. If the unit hydrograph is being developed at the outlet of the watershed, the area should be that of the entire watershed. This figure is mandatory, and must be provided whether natural unit hydrograph or synthetic unit hydrograph is used. The model utilizes this area to generate unit hydrographs at other locations in the watershed. Unit Hydrograph Method: This refers to the type (i.e., natural or synthetic) of unit hydrograph, and the method used to generate synthetic unit hydrographs. · If the unit hydrograph is provided by the user (i.e., an existing unit hydrograph is used), an explicit optionhas to be chosen. The model accepts existing unit hydrographs in the form of pattern. 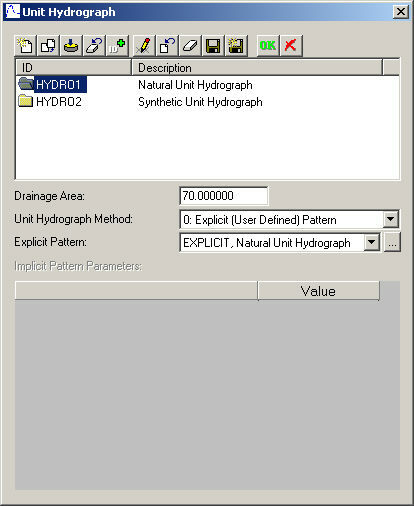 Assign the unit hydrograph pattern using the “Explicit Pattern” dialog box. 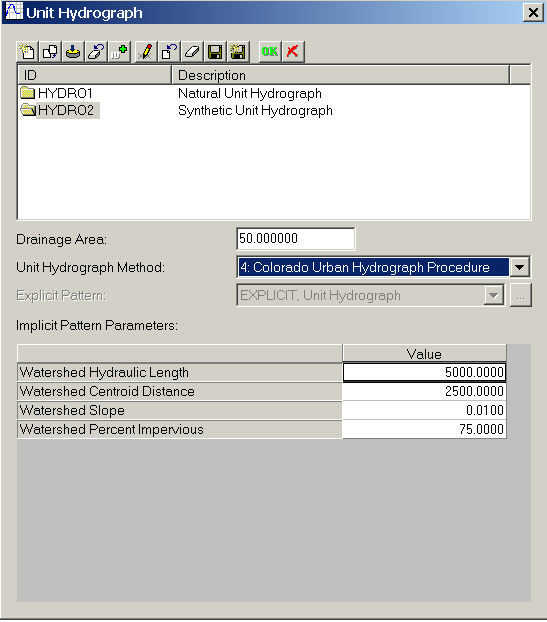 · If a synthetic unit hydrograph generated by InfoSewerH20Map Sewer Pro is to be used, the modeler may choose one of the four implicit unit hydrograph (i.e., the tri-triangle method, the SCS dimensionless unit hydrograph, the SCS triangular unit hydrograph, or the Colorado Urban Hydrograph Procedure) options. Inputs for each of these four synthetic unit hydrographs are described below. · Tri-triangle method: Once this option is selected, the following dialog box would appear enabling the user to specify parameters of the tri-triangle. These parameters are described using the following figure. R is the percentage of the total rainfall volume that becomes runoff. Please, note that InfoSewerH20Map Sewer Pro has advanced rainfall loss modeling capability and can estimate effective rainfall (, i.e., part of rainfall that becomes runoff). If this loss modeling feature is used, R should be set to 100%. R1 , R2 , and R3 are percentages of R that are allocated to triangle 1, triangle 2, and triangle 3, respectively. For example, assume that R equals 40 % of the total rainfall volume and R1and R2 are 30% and 40%, respectively. The actual volume of runoff allocated to triangle 1 and triangle 2 would be 0.4*0.3* total rainfall volume and 0.4 *0.4* total rainfall volume, respectively. R in InfoSewerH20Map Sewer Pro is the same as R1 in SWMM 5 and InfoSWMM, R1 is the same as R2 in SWMM5 and InfoSWMM and R2 is the same as R3 in SWMM5 and InfoSWMM. T1, T2, and T3 are time to peaks of triangle 1, triangle 2, and triangle 3, respectively. K1, K2, and K3 refers to recession constants of triangle 1, triangle 2 and triangle 3, respectively. The default values used by InfoSewerH20Map Sewer Pro for T1, T2, T3 , K1, K2, and K3 are 1 hour, 4 hour, 12 hour, 2, 3, and 3, respectively. 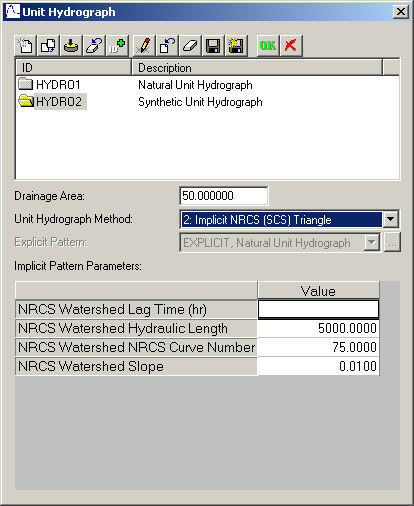 · NRCS (SCS) Triangular Unit Hydrograph: Generation of unit hydrograph using this method requires specification of the inputs displayed in the following dialog box. o Watershed Lag Time – this represents the time from the center of mass of effective rainfall to the time to peak of a unit hydrograph. In other words, lag time is a delay in time, after a brief rain over a watershed, before the runoff reaches its peak. 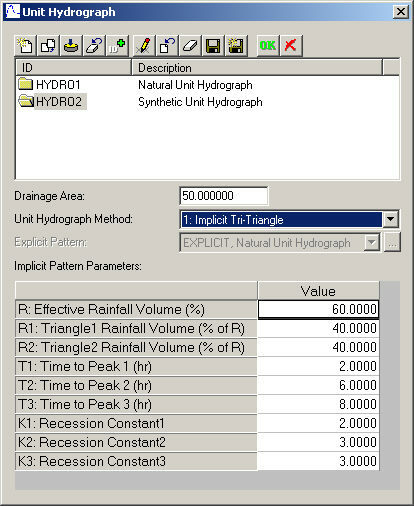 This parameter can either be specified by the user, or can be calculated by the model based on watershed characteristics. If lag time of the watershed is directly specified by the user, the modeler does not need to provide the remaining inputs (i.e., hydraulic length, the curve number, and the slope). o Watershed Hydraulic Length – This refers to travel distance of water from the most upstream location of the watershed to the point where the unit hydrograph is being derived. This input is required if watershed lag time is not specified. The value should be given in feet for US Customary system, and in meters for SI units. o Watershed NRCS (SCS) Curve Number – This parameter refers to runoff generating capacity of a watershed, and its value depends on the soil, antecedent moisture condition, cover and the hydrologic conditions of the watershed. Recommended values of curve number are available from standard hydrology books. The SCS suggests the curve number values to be within 50 and 95. This input is required only if watershed lag time is not specified. · Watershed Slope – Refers to average slope of the watershed. This input is required if watershed lag time is not specified. · NRCS Dimensionless Unit Hydrograph: The inputs required for this method are the same as those described with regard to the NRCS (SCS) triangular unit hydrograph. · Colorado Urban Hydrograph Procedure: This technique requires provision of the following subwatershed information. · Watershed Hydraulic Length – This refers to travel distance of water from the most upstream location of the watershed to the point where the unit hydrograph is being derived. The value should be given in feet for US Customary system, and in meters for SI units. · Watershed Centroid Distance – Travel distance of water from the most upstream location of the watershed to the centroid of the catchment. The value should be given in feet for US Customary system, and in meters for SI units. · Watershed Slope -Refers to average slope of the watershed. This input is required if watershed lag time is not specified. An entire watershed of a collection system may not be well represented by a single unit hydrograph due to variability in topography, land use, and soil characteristics of the subwatersheds. InfoSewerH20Map Sewer Pro allows usage of multiple unit hydrographs, each representing part of the watershed being modeled. This is an advanced functionality usually referred to as spatially distributed modeling. This implies that, if interested, the user may use unique unit hydrograph for every loading manhole in the collection system. All the unit hydrographs utilized for modeling of the watershed should be created following the procedure described above. The created unit hydrographs may be assigned to loading manholes in the collection system through the Attribute Browser or by using the hydraulic/hydrologic manhole data base table. It should be noted that, if multiple unit hydrographs are used for modeling of a collection system, the type of all the unit hydrographs need not be the same. Some of the unit hydrographs could be NRCS (SCS) triangular, some others could be NRCS (SCS) dimensionless, and the remaining could be explicit or could be derived using the tri-triangle method.